This is where you can find all the wood pergola plans in one place! 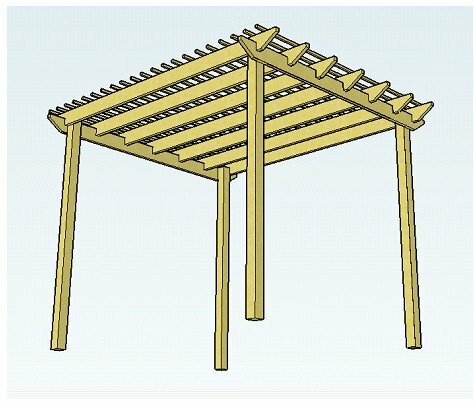 The plans are simple to follow, and give step-by-step instructions for building a pergola from scratch. There are several different styles to choose from, and all come with 18 free rafter tail templates to make your pergola really stand out from the crowd. Just follow the picture links, which will take you straight to the plans. 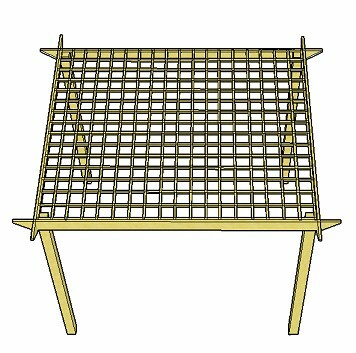 Most traditional pergolas can be made from these plans. By making small modifications, a whole range of different styles, shapes and sizes can be created: long and narrow, square, wide - whatever fits your space. Use thicker wood for a more substantial feel, purlins for extra shade and decoration, or just build a pergola as set out in the step-by-step instructions. All the pergola designs and plans can be modified in this way, having detailed instructions on how to make the changes, so that you get the pergola you really want. 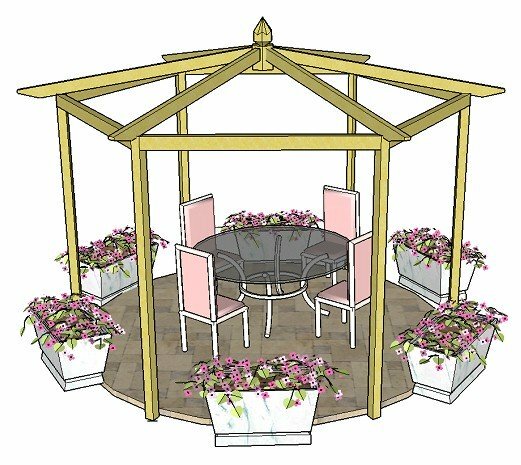 The main plans are a standard box pergola (shown above with a rambler rose and clematis) with notched rafters that run in both directions. Have them running only one way, or both ways - it's up to you. It's possible to make any rectangular or square pergola from these plans. 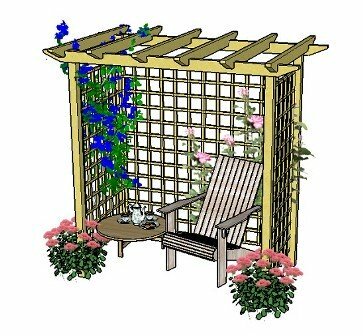 The first simple pergola design is one which requires very little notching, as it uses trellis for the roof instead. The second simple pergola design has no notching at all! I do like a notched rafter. It makes the pergola look as if everything is bound and connected. There are so many different styles of pergola you can make from the main free pergola plans. 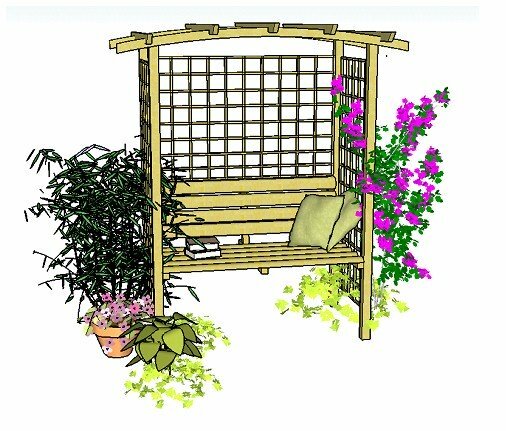 The first simple pergola design uses trellis for the rafters: a simple way to achieve the feel of rafters...fast! The only restriction is that the pergola footprint size is determined by the size of the trellis panel you use for the roof. 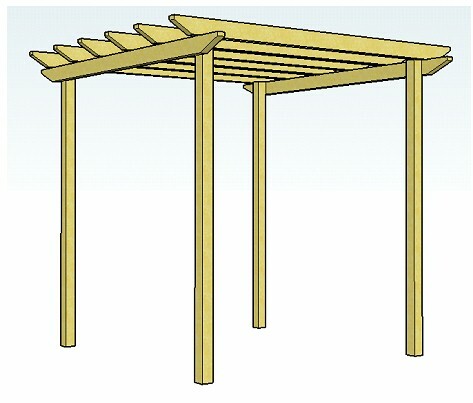 The second simple pergola design has rafters that sit on top of the supports. This means there is no notching at all. The rafters are fixed with metal clips. Easy! 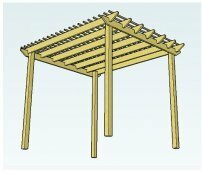 This pergola picture shows how the main wood pergola plans can be adapted to include notched and raised rafters with purlins. Purlins are added for extra shade, or just for their decorative effect. All is explained in the free pergola plans. 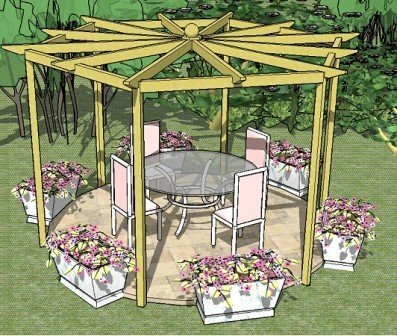 Visitors to the website will sometimes ask for specific plans for a pergola they wish to build, and this is how most of these additional plans were conceived! 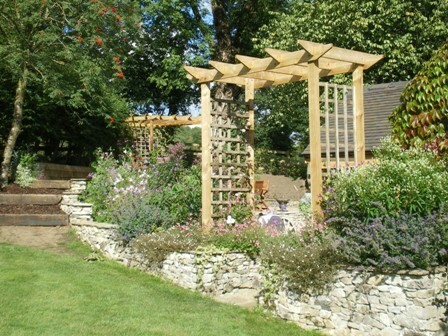 They are interesting to develop and great fun to build, so if you have a special request, your wood pergola plans may be included too! 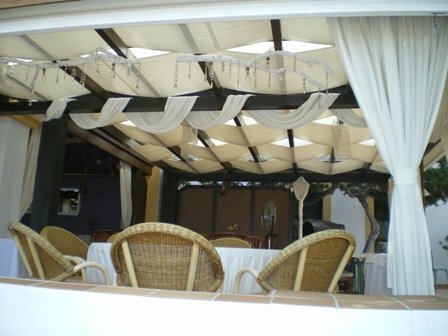 a pergola, arch or arbour, which can be made from the same plan. and a arbour with an integral seat. Attached to the house, this pergola design is very popular for good reason...it creates an extra room to relax and entertain. Priceless! Both of these pergola styles can fit beautifully into a corner of the garden or patio: the first being a traditional design with radiating rafters, the second with wonderful curved, Asian style rafters. 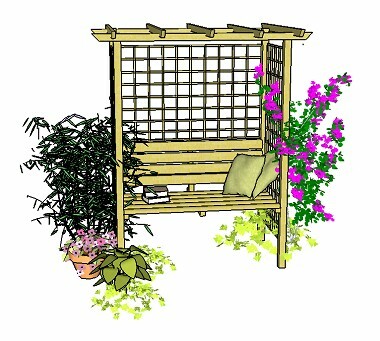 The traditional corner pergola was adapted to fit into the recess where the seat can be seen. The corner pergola plans are, however, written for a true corner. It really is a very satisfying pergola to build! 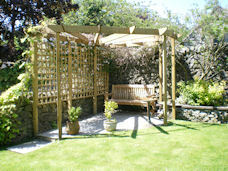 Also with radiating rafters - either a six or twelve spoke design - we have the hexagonal pergola. It's possible to use this design as a patio pergola, too. Then we have the arbour pergola plans which can be made into an arch, an arbour, or any size of pergola. The ones here all have a raised rafter style. The arbour is created simply by using trellis to enclose the space, and then using free-standing garden furniture inside to make a cosy retreat. 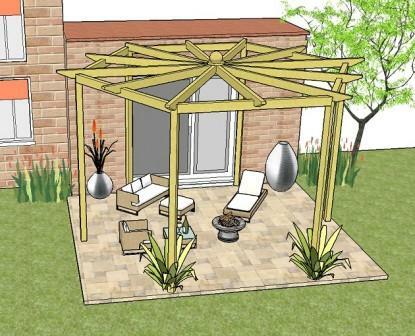 Here, the arbour pergola plans are used as a garden arch over steps. 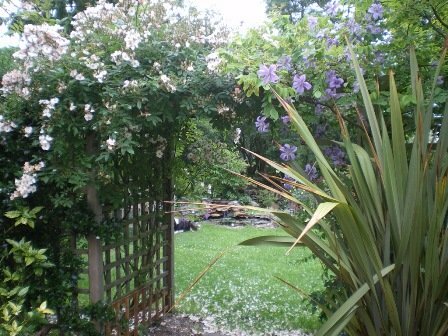 It is set in raised beds and has climbing plants growing up the trellis. 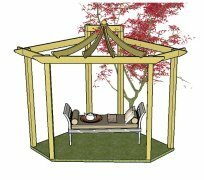 The seated arbour plans can be made in two different styles, the first having a beautiful, curved main rafter, the second with very easy to build straight rafters. Unlike the arbour above, both of these designs have an integral seat. 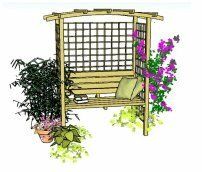 All of the plans come with free rafter tail template to suit the pergola design. 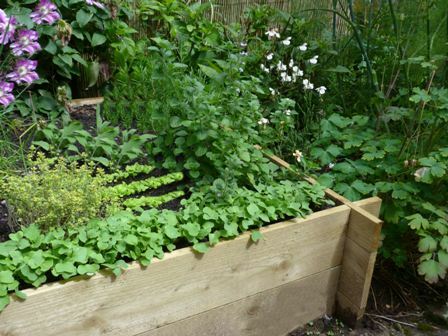 If you need plans for an easy to build raised bed, take a look at these free plans. The planter can be made with or without the 'fins', and using any thickness or length of wood. Build one in any dimensions you like. 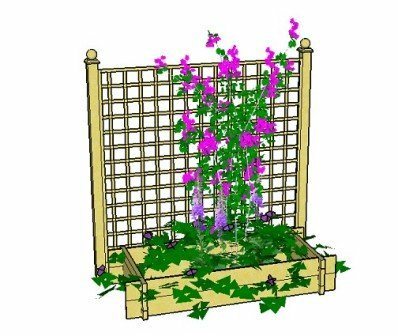 You can use this design as a pergola planter, or under a trellis screen, with which to create a lovely display: to provide colour in a small space, or to create a divider between two parts of the garden. This gives an idea of what it might look like. Need to lay a patio under your pergola? 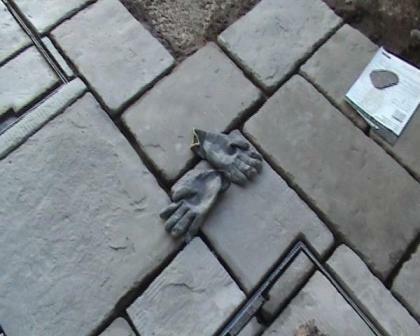 Find out how the professionals lay a patio in the video tutorial, which covers: digging out, installing drainage, disguising unsightly drain covers, laying the slabs using the correct materials and techniques, and pointing. The free supplementary notes show how to calculate quantities, falls, and answers patio related frequently asked questions. 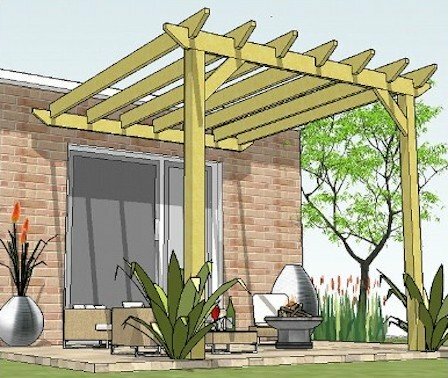 They also show the different ways of constructing a pergola and patio combination (this is a bit like solving the problem of which came first, the chicken or the egg!). I hope you find the wood pergola plans you are looking for. If you have any questions about the plans and how they can be adapted, feel free to get in touch using the contact form. Learn how to do things a step at a time and it will all come together beautifully!